Today's guest artist was Jess Johnson. She created an amazing space for Melbourne Now exhibition. You can watch it here at NGV website. It's really great to meet seriously talented young artists, and learn from them. 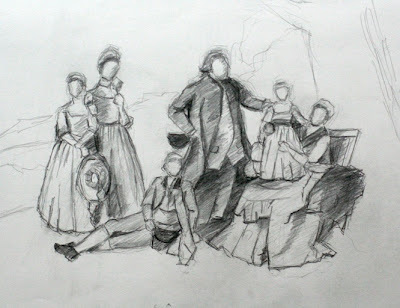 Here is my quick sketch of a painting in the gallery room. I can't remember its title. I found it very difficult to draw a group portrait, measuring all proportions.